The current environment for tech start-ups is fraught with risk. Deciding when to grow and where is one of the biggest questions facing today’s new tech leaders. To avoid the pitfalls of stalling like the vast majority of new tech firms, start-ups in small tech ecosystems need to go global from day one. This strategy is complicated, however by the economic benefits of staying local – job growth, quality of life and an understanding of the cultural and legal environment. So, the question remains, how do we create domestic value in a global tech economy? To discuss the solutions and interrogate the multitude of tech ecosystems around the world, the Lazaridis Institute for the Management of Technology Enterprises will welcome tech experts and global thought leaders to DRIVE, Canada’s inaugural global conference on scaleup ecosystems. Co-hosted by Hockeystick and hosted at the Lazaridis School of Business and Economics, from Feb. 20 to 22, DRIVE will bring together thought leaders, policy-makers, academics, funders and founders to push the boundaries in defining and building tech ecosystems. Daniel Isenberg, investor, author and professor at Babson College. 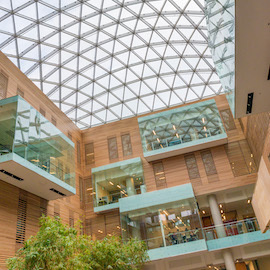 Located in Waterloo, Ontario, the heart of Canada’s fastest-growing tech ecosystem, the Lazaridis Institute is a research centre affiliated with Wilfrid Laurier University. The Lazaridis Institute makes a positive impact on the Canadian technology landscape by developing new experts and leaders in this field. Register for the DRIVE conference before February 19.